1-45 Parallax can be a problem when you are reading a meter. 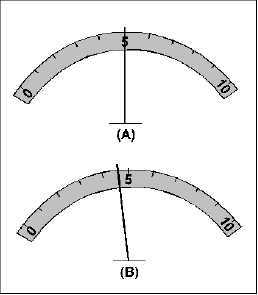 Since the pointer is slightly above the scale (to allow the pointer to move freely), you must look straight at the pointer to have a correct meter reading. In other words, you must be in line with the pointer and the scale. Figure 1-41 shows the effect of parallax error. Figure 1-41.A parallax error in a meter reading. Figure 1-41 (A) shows a meter viewed correctly. The meter reading is 5 units. Figure 1-41(B) shows the same meter as it would appear if you were to look at it from the right. The correct reading (5) appears to the right of the pointer because of parallax. The mirror on the scale of a meter, shown in figure 1-39, helps get rid of parallax error. If there is any parallax, you will be able to see the image of the pointer in the mirror. If you are looking at the meter correctly (no parallax error) you will not be able to see the image of the pointer in the mirror because the image will be directly behind the pointer. Figure 1-42 shows how a mirror added to the meter in figure 1-41 shows parallax error. Figure 1-42(A) is a meter with an indication of 5 units. There is no parallax error in this reading and no image of the pointer is seen in the mirror. Figure 1-42(B) shows the same meter as viewed from the right. The parallax error is shown and the image of the pointer is shown in the mirror.